We are at Sandhurst, Berkshire, close to the boundaries with Hampshire and Surrey. Meetings and Shows are held at the Community Hall, behind the main car park. Ordnance Survey Grid Reference SU842612. Note that the hall car park is locked overnight, but in the unlikely event that the meeting over-runs the caretaker will know we are still there and not lock us in. Please check pickup point with the organiser. It is likely to be in Yorktown Rd, either near the library or near Sandhurst Day Centre (next to the Community Hall car park, as above). 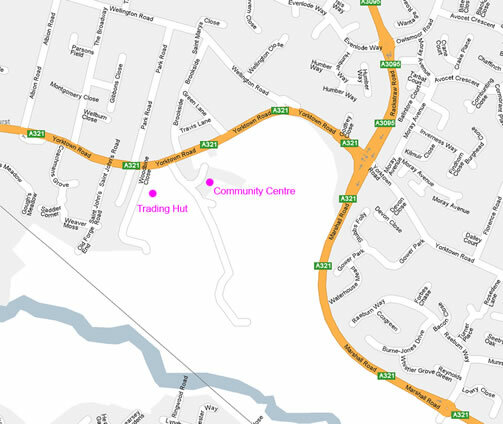 The Trading Hut is also off Yorktown Road at the edge of Sandhurst Memorial Park behind the Pistachios in the Park cafe. The hut is a short way along on the right; see the Trading Hut page for more information about access. Ordnance Survey Grid Reference SU840612.